Wanna know the KEY difference between successful businesses and ones that fail right out the gate? A lot people don’t understand this, even though they’ve heard it before (you might even preach this to other people!). You see, there’s a lot of talk in digital marketing about the “overnight success,” but what we don’t hear about (because it’s not always pretty) is how to grow a successful business for years afterward. If you’re in business to make a real IMPACT with real people, listen to this episode for my long-term game plan! Hey guys. 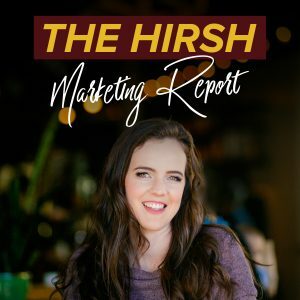 In today’s episode, I’m going to share with you the key difference I feel makes [the difference between] successful marketers and failing marketers out there. So we have over 60 clients on our roster, and I feel like, over the last two years, I have seen a lot of things behind-the-scenes. And not just from our clients, but also from talking to potential clients, from just having relationships with really high-profile clients. And what that’s done for me is really given me a good idea of what… what key factors bring people success in their marketing and in their business. And this is one that I’ve talked about on Facebook live, I talk about it all the time with clients, because it is so, so important, and a lot of people don’t understand this. I’m not saying that that’s not possible. Like, ahundred percent, those people probably have legitimate stories – and I know people with those stories. But, what’s not taken into account is the years before that of failure, and things that they did wrong and learned from, and made mistakes, and then ultimately, [that’s what] got them to where they got. (But I’m not going to go into that mindset/philosophical piece of this!) Today I want to talk about like, how the long game actually ties in with marketing. And I want to use an example of somebody who launches a product for the first time, launches a product or a service/course/whatever for the first time, and how that works. So, when you launch something for the first time, you most likely are starting out with zero list, right? Like, if you’re starting a new brand… And I mean, maybe you’re launching a new service and you already have a list. But let’s just say you’re launching something new and you don’t have a list. So basically like, unless you have either like, somebody who can promote your stuff as a JV or a huge organic audience and following who’s just been waiting for you to do things (but chances are you have a list if that’s the case), you’re going to have to pay for all of those people to come onto your list. And you’re going to have to spend money to get that traction, and then only a small percentage of them are going to buy. And, when you launch something new, a lot of times people aren’t going to buy it the first time they hear about it. So, we have this amazing client, and she launched a membership site… six months ago probably. And the first launch… And I told her this, I said, “Look, we’re going to break even this first launch, and it’s going to be a huge win. Here’s why. Because your list is zero, you’re following is zero – nobody knows who you are in this space. You have amazing content, and we know that, and that’s why I’m working with you. But nobody knows who you are yet, and we have to prove that. We’re going to go and launch this, and we’re going to build this list. And a small percentage of people will buy, because this launch is going to be good, your Facebook lives are going to be good, our ads are going to be good. But because it’s also a membership site and it’s not a huge amount of money, we’re going to break even. Then the next time we open the doors to the membership site, it’s going to be easier, because that whole group of people who have been sitting on your list since the very first day we started building it, [they] are now going to come [from] behind the curtain and buy. And each time, it’s a snowball effect, and it’s going to get easier.” This is true with live launches, this is true with evergreen webinars, this is true with everything that you sell, because you grow your list, you nurture that list, and ultimately, then you will be able to sell more people down the line. But the first time is the hardest. And if you break even the very first time that you launch a webinar or a course, and you do a live launch, a video series, whatever – you are winning. And I want people to understand this, because marketing is all about that long game and projecting and this… This was inspired because I just got off a call with that client. And I’m going to be honest: The first time that she launched, she came back, and she was like, “I don’t feel like this was a success. Like, we only broke even, and I’ve invested $X amount.” And I had to explain to her like, “Look, you built a whole following!” And then, when she saw that, and like… The next time we doubled her launch, and now we’re prepping for January, and it’s going to be huge. And this is not just this client. Every single client and person that I see who plays the long game, and can see the benefit of that and the snowball effect that consistent marketing has, is able to see success. But the people who invest every last penny into their marketing, to the point where like, if they don’t make 3X what they invested by next month, they’re out of business… They will fail. One hundred percent, they will fail, because there’s so many factors and things that you have to fix in your marketing and improve… But also you guys, here’s the key: Because it is the snowball effect, because you have to nurture people… You can’t just look at your funnel as like, there’s one entry point – they go to a webinar and then that’s it. Then I have a lead on my list, and I don’t do anything with them. You need to build in very intentional nurturing and very consistent nurturing. Consistency is a big key point here, because in between… This client that I’m referencing, [in between] these launches like, she does Facebook lives, she does regular emails, she talks about this membership site where the doors are closed (so she’s seeding it and she’s always referencing it), and she’s staying top of mind. Then, when she reopens the door, she has people who are sitting on her list who buy, who – at that point – cost her $0, because we’ve already paid for them. And every single time it gets bigger. When I also look at our biggest clients, we have clients who have been launching for five, six, seven, eight years – the same product once or twice a year. And [when] we look at the average time somebody is on their list before they buy, sometimes it’s a year. That’s crazy! That is the long game. And the key here is… They’re not just getting people in a funnel and then forgetting about them. What does your nurturing on the back-end look like, so that you can monetize the crap out of these leads that you’ve already paid to get? And that is so important. And this takes time. The reason why people don’t do it is because they want the overnight success or the one-month success or even the two-month success. 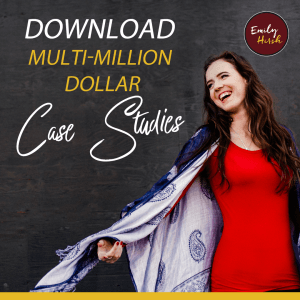 And you have to always be looking and projecting like, “Okay, I have these leads and now, how am I going to continue to monetize and nurture them and stay consistent?” When I think of one client example we have… So they’ve launched eight years in a row, once a year, [one] product. The average value of the customer is a year. But in between that whole time of [when] they launched, they’re doing regular videos, they are doing all types of nurturing … just super consistent value. And the other thing is, when you look at their brand, it’s obvious that they actually care about the content and the value. And this client that I’m referencing with the membership site, she gets emotional over the people that she’s helping and what she’s putting out into the world. The drive is obviously money, because more money, more impact. But also, impact is there. And it’s not like… Whenever someone comes to me and is like, “Oh, I just want to launch this so I can make $X amount of money,” and they don’t care about the actual impact and who they’re actually targeting, connecting with them on an emotional level… I know that it’s not going to be successful, because that’s missing. And so, in summary, what you guys need to take away from this is… I want you to look at your marketing… And, are you looking at it from the long game [viewpoint]? I mean honestly, business should be looked at from the long game. We plan quarterly – our quarterly targets and our annual targets – in my business. And I think as entrepreneurs, we want everything tomorrow! I want everything tomorrow, right? But with marketing, especially if it’s a new brand, you have to build people’s trust. These are people that we’re talking about, and it takes consistency and building that up – and then you get testimonials and people talking about you. Are you looking at your marketing from the long game? And then, are you being strategic with your long game, or do you just have like, a webinar where people come into the webinar, they go to the webinar, [and] if they don’t buy, that’s it? I mean, come on, you paid for those leads. The retargeting, and the nurturing, and the reselling, and reoffering your thing to them is where the money is a lot of times, because the first time somebody hears about something, oftentimes they don’t buy. Some do, a small percentage do. You know, 1-3 percent of people that come into a webinar will buy the product, depending on the factors of how much the product is. But then, what about the rest of the 95% of people that came onto your list, what’s happening with them? And, I feel that some of the influencers in this space have created a culture where we think, “Oh, we’re just one funnel away.” I love Russell [Brunson], but “one funnel away,” it’s like, “Yes, we’re one funnel away, but one perfected funnel away!” That takes time to get there. It’s not one funnel, launch it, and we’re good. And I feel sad when I see people launch a funnel, it doesn’t do what they wanted in 30 days or less, and so they shut it down, and they go back to the drawing board. I’m like, “But we had all these good pieces from it! And we can take that data, and we can make it better!” And I think because we’re entrepreneurs, we want things tomorrow. And also, we’re all in or all out a lot of times, and we have so many ideas that it actually hurts us with our marketing. And so the key is that focus, that long game and nurturing consistent… Be a consistent brand, that consistently delivers value. If you guys need help with your strategy, with your marketing plan, with analyzing things that you’ve done or putting together a plan that will ultimately bring you in leads and sales in a very strategic way, go to HelpMyStrategy.com and book a call with the Hirsh Team. Thanks so much for listening.